Contrary to reports gushing out of the Western media, shale oil and gas won’t kill off the Russian economy. Is the United States set to dethrone Saudi Arabia and Russia as the new 800-pound gorilla in the world energy market? The International Energy Agency (IEA) in its World Energy Outlook 2013 released last month says the United States is set to stride past Russia to become the world’s top oil producing nation by 2015. The report has set off a gusher of stories in the American media, promising a new era of US energy independence. Plus, they are pumping out predictions that the Russian economy, which is heavily dependent on oil and gas, is likely to collapse. It is true there has been a massive spurt in oil and gas production in the United States. The new F word in America is fracking or hydraulic fracturing, which involves pumping a cocktail of water and chemicals into shale rock formations. This breaks up the shale, releasing oil and gas trapped in the rock. Plus, the United States is going big on horizontal drilling, which allows one vertical well to tap widely into a whole layer of oil or gas. 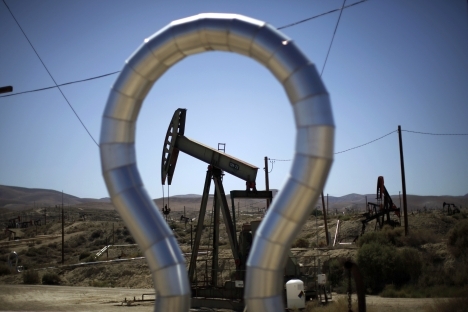 US President Barack Obama hopes fracking will turn America into the “Saudi Arabia of gas”. Others are more direct. Republicans, pushing a bill that will allow US gas exports, believe the new legislation will “promote the energy security of key US allies by helping reduce their dependence on oil and gas from countries, such as Russia and Iran”. But when something is too good to be true, it probably isn’t. There are two problems here. One, the chemicals used in fracking are extremely hazardous and can leach into ground water reserves. Residents in areas where fracking is rampant now find their water supply is now undrinkable. It remains to be seen how long the US public will tolerate the destruction of its habitat. The single biggest factor that negates the shale boom and keeps prices high is the insatiable demand for energy in emerging countries. With global energy trade already re-oriented from the Atlantic basin to the Asia-Pacific region, China is set to become the world’s largest oil-importing country. And after 2020, India is forecast to become the largest single source of global oil demand growth, says the IEA. It is also on course to become the largest importer of coal by the early 2020s. An interesting development is that the Middle East will emerge as a major consumption centre, emerging as the second-largest gas consumer by 2020 and third-largest oil consumer by 2030. The IEA says the centre of gravity of global energy demand is now moving decisively towards emerging economies. By 2035 they will account for more than 90 per cent of net energy demand growth. So even if the US is able to flood the market with new oil, the likes of China and India will soak up that supply. Though not as dominant as it was in yesteryears, the Saudi Arabia-led Organisation of Petroleum Exporting Countries (OPEC) is still a key player in the oil business. Saudi Arabia has for decades been dictated terms by the United States, in exchange for a security umbrella. It is fact that the al-Saud royal family wouldn’t last a week without American protection. During the 1980s, the US was able to pressure Saudi Arabia to turn on the kingdom’s oil spigots and flood the world markets with cheaply extracted crude, depressing prices. This was intended to hurt the Soviet economy, and the Saudis happily obliged. With the “godless” Soviet Union gone, and now faced with a huge budgetary hole, the Saudis are not so keen to deflate oil prices. The big news on the Russian front is that a spurt in production, especially at Gazprom, brought Russia’s oil output to a new post-Soviet record high of 10.59 million barrels per day in October 2013. The Russian surge has come against every dire projection of dipping output by Western analysts. Though there have been no new greenfield developments for a long time, Russia plans to unlock more deposits by seeking Chinese investments to drill more wells. In the daddy of all deals, in June 2013, Rosneft, the world’s largest listed oil producer, agreed to supply China National Petroleum Corp with 300,000 barrels a day of crude over a 25-year period in a deal valued around $270 billion. A bunch of other comparatively smaller deals signed by Gazprom’s rival Russian oilcos with Chinese refiners will see oil and gas – originally meant for Europe – move east to China. The IEA may be bullish on growth in US production related to the shale boom, but it notes that production will plateau and eventually decline as major oil fields in Texas and North Dakota will be past their prime. Also, rising US production does not mean low prices because whatever it produces is consumed internally. It is merely displacing imported Canadian and Venezuelan oil with the home drilled stuff. And because oil is an international commodity there is no significant impact on prices. So unless the United States becomes a large energy exporter – an unlikely scenario – shale oil won’t be a game changer. Route Magazine reports that because of strong anti-fracking grassroots movement in Europe, many countries have shelved unrealistic shale projects despite the fact that European energy prices are double those in the US. Germany has set strong barriers against fracking and France’s president Hollande has blocked shale initiatives. “The only apologist of fracking in the European Union is Britain, which is strongly influenced by US companies trying to sell it drilling equipment,” says the magazine. Poland – another loyal ally – has allowed fracking on its territory, but there too people have launched protests. Fracking may cause environment hazards and earthquakes but if the United States is relentless in its shale exploration programme, some good might come from it. If the world’s largest importer can become self-sufficient, it will over time end Saudi Arabia’s ability to influence prices on the world oil market. Along with that it will diminish the kingdom’s ability to export its other major commodity – wahabi fundamentalism.